Found only in two mountainous places in the Western‚ and Eastern Cape. The Cape Mountain Zebra very nearly went the same way as the Quagga. 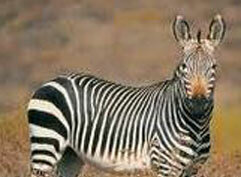 It was saved just in time by some farmers which helped to from the Mountain Zebra National Park. Today, while still very endangered, their numbers have grown to a few hundred again. The mountain zebra have a cleaner look than do the the more abundant zebra in the north, due to the fact that it's white stripes doesn't have an extra grey colour running in the white (as is the case with the burchell's zebra). The mountain zebra is shorter, somewhat smaller but more solidly build, with a slightly different colour pattern than the other zebra. This can best be seen at the legs, rump and under the belly, while it features a loose piece of neck skin as well. It will normally live for about 24 years.